This course details the exploitation of the LibSSH authentication bypass: CVE-2018-10933 and how an attacker can use it to run commands on the underlying OS. It can also be used for port redirection in order to gain access to internal systems. The issue comes from the way libssh doesn't maintain state for the authentication and how this can be used to bypass the authentication. Basically, think of the connection as a multi-step process: step1, step2, step3... Since libssh doesn't enforce the order of the steps, you can basically jump to step3 without going through step1 and step2. Interestingly, the same issue was found in the SSH library Paramiko earlier: CVE-2018-7750. You connect to the victim using a socket based on the hostname and port, then you wrap paramiko around the socket. Then, you can send the message telling the server that you are successfully authenticated. Finally, you can send the command you want to run (uname in the code above). 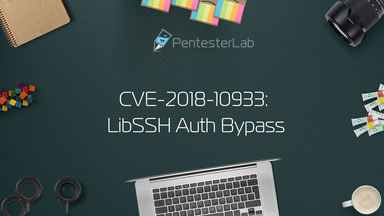 This exercise showed you how to exploit the bug libssh authentication bypass (aka CVE-2018-10933). I hope you enjoyed learning with PentesterLab.